I recently sat down to watch Legend, Tom Hardy’s suave, charming and volatile portrayal of the Kray brothers; one actor playing identical twins with some very clever camera trickery. The dapper gangster twins ruled London in the 50’s and 60’s rubbing shoulders with stars and the establishment. This film is brilliant, much better than the Kemp brothers depiction where I couldn’t get passed Spandau Ballet – so true! Tom Hardy is excellent, handsome and threatening in equal measure and this got Carppuzzle thinking, we have the Ronnie rig but where is the Reggie rig? The Ronnie rig much like its terrifying gangster namesake has been bossing waters up and down the country, and making headlines as anglers extort carp from all manor of lakes. 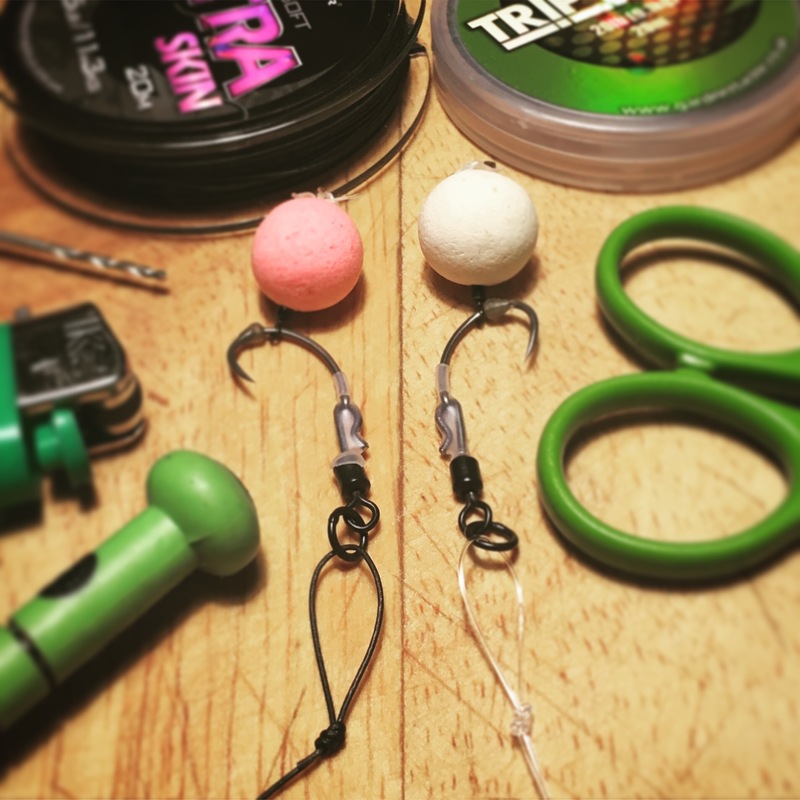 So popular is the rig that Carpology has subscription deals where you can get all the components, and I’ve even seen then “really tied” on eBay. Now if you cannot “tie” this rig you should be fed to the fish; gangster style. But what could the Reggie rig consist of? As the father of twins, I know the difference should be very subtle. At first glance the same but on closer inspection you can see a very slight difference. From the top down, Avid boilie stop, Fox hook bead, Korda kurve hook size 6, Bank Tackle swivel and Korda shrink tubing. For me changing the boom section is enough of a difference. Rather like changing my twins shoes, it’s the last thing you notice, and then it’s too late. For Ronnie, Gardner Ultra Skin, for a dirty bottom (no pun intended), super soft to allow the lead to bury a tad, yet still present nicely over debris. Out of the confusion he’ll viciously hook an unsuspecting carp. Deadly. For Reggie, Gardner TripWire, for a clear bottom, transparent and stiff enough to kick the hook away from the lead. More business like, functional but equally clever, he’ll snare a passing carp. Deadly. You could change the pop-up but that is too obvious. Much like cutting my twins hair differently. Having said that I have gone for two different colours but in hindsight there is only one bait for these rigs – Nash Key Kray [sic] Pop-Ups!